It was entirely coincidental, but my timing looks pretty good as a result: right after my last post on corporate sponsorships, three Sistema programs in North America announced gifts of instruments from major manufacturers; Sistema Toronto and the New Brunswick Youth Orchestra received instruments from Yamaha Canada, and the El Sistema@Rainey program in Cleveland (led by Abreu Fellow 2011 Isabelle Trautwein) was the beneficiary of an in-kind donation of thirty violins from Conn Selmer. Instruments represent the number one capital expenditure of any Sistema initiative, even if very few purchase them new. The default option, the “instrument donation drive,” has evolved into something of a rite of passage for new programs, and for good cause: it’s excellent publicity, and it reduces start-up costs considerably, although not entirely. There’s no such thing as a free viola, unfortunately, as the instruments that are donated almost always require some degree of maintenance or repair, especially strings. Even once restored to playing condition, they continue to need constant care, especially strings. They’re also extremely fragile… especially strings (hence the paper violin teaching tool – read the Strad article here). Instrument restoration and upkeep can often be provided in-kind by a local luthier or music store, but the real compromise inherent in the instrument drive is that the donated articles are rarely appropriate for young children. Student versions of some winds differ considerably from their professional counterparts, and string instruments come in a host of smaller sizes far more friendly to young players. Getting the right instruments for an optimal learning experience can be a challenge, which is why the corporate gifts to the three programs above were so important; the students will have a far easier time getting their hands and fingers around their apparati, meaning better experiences. Unfortunately neither Yamaha Canada nor Conn Selmer has the capacity to donate to every worthy program, which leaves many other organizations struggling to equip their students optimally. Even if they find the resources to do so, there’s another challenge, that of inventory “shrinkage.” I’ve heard numerous accounts of programs that allow instruments to go home, and then never see them again. These aren’t necessarily incidents of willful theft; in the US, where the populations/demographics served by Sistema programs tend to be extremely mobile (as compared to Europe, for example), returning a ¼ size violin to a school when moving a household is a low priority. So between acquisition, repair or replacement, instruments are just a financial black hole… if you give them away. I’m going to venture into dangerous territory here with the suggestion that perhaps that’s not always the best thing to do. The problem with giving something away – be it instruction or instruments – is that you can easily create the perception it has no value, and even something as worthy as Sistema isn’t immune from this phenomenon.There’s a program that deliberately charges its students a very nominal fee of $10 each term, based on the experience that if they didn’t, parents didn’t bother to ensure their children came. With very, very modest parental financial investment came much higher levels of engagement. Could we do the same for instruments? It’s a more difficult question, because they’re habitually a larger lump sum, and as such represent a significant barrier.The complete elimination of financial barriers is a cornerstone of what Sistema-inspired programs attempt to achieve, but there are different ways in which barriers can be removed. A $200 violin might be an excellent candidate for a microfinance program, for instance. Pioneered in Southeast Asia by Grameen bank and Muhammad Yunus, microfinance has proven remarkably effective in helping reduce poverty and improve self-sufficiency around the world. The concept is fairly simple: the loan is issued, the principal amortized over one or two years, and the interest set to reflect opportunity cost, program management expenses, insurance on the collateral, and coverage for potential defaulters. Added all together, the interest rate can often be quite high, but even at 20% of the principal, it represents a small additional sum – $40 for that $200 violin, meaning a total obligation of $10 a month over the 2 year repayment period (rather than $8.33/mo interest free). That’s much cheaper than a cell phone – and programs can institute a buy-back plan in which an instrument returned in good condition is credited at its full value towards the purchase of the next size up. When I presented this as part of a seminar on Social Entrepreneurship at NEC to an audience that included some of my co-Fellows, there was a bit of skepticism (if not horror) over this idea. That’s understandable, if you leap to the conclusion that microfinance becomes a hard-and-fast blanket policy, but it’s actually a very flexible idea. Need another horn player? Offer an instrumental “scholarship.” Too many violins, not enough violas? Lower the interest rate for the latter. In this regard, the concept reflects the reality and practice within Venezuela, but with an important upgrade. Yes, everyone gets to play in La Red, but not everyone gets to play trumpet. If you can’t afford your own instrument, or one isn’t available, you choose another that is. With microfinance, someone very determined to play trumpet might actually be able to do so. Maybe it’s only applied to the most expensive instruments – maybe certain students in dire financial straits always get a waiver. Also, as an idea in the music world it’s not strikingly original on my part. I just learned that Arts Council England has a very similar program called “Take it Away” through which they support the purchase of musical instruments by young adults. The Henley Review (essential reading for all music educators!) made the recommendation that the program be expanded to include all youth in school, but whether this happens is up to ACE, and outside of the Government’s purview. I don’t advocate that microfinance is always, or even often, the right way to go, but it’s an idea that should be considered more carefully. 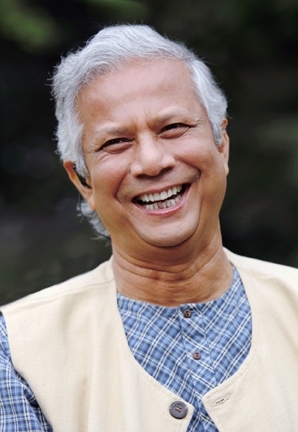 Given that Grameen Bank and Muhammad Yunus received the 2006 Nobel Peace Prize for their work, microfinance might actually be entirely consistent with Sistema‘s social goals. We are thinking of every way we can soften the blow of purchasing instruments so that we can get the sturdiest instruments possible. Fund raising is time consuming so we want the instruments to last as long as possible. It may require a many pronged approach.